Nadia Anjuman was an Afghani poet and the author of Gul-e-dodi / Dark Flower (2002) and Yek Sàbad Délhoreh / An Abundance of Worry (2006). She died in November 2005 after a physical altercation with her husband at the age of 25. 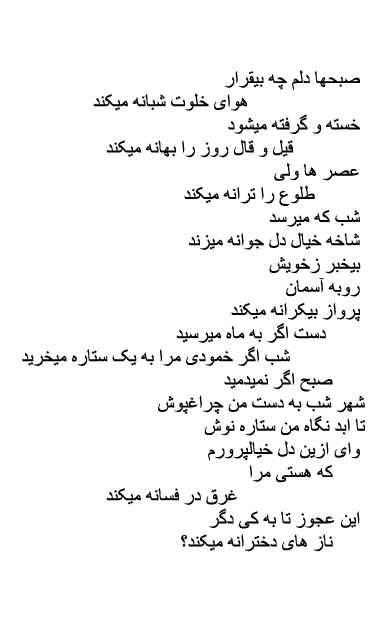 In 2007, Anjuman’s complete works were published in the original Persian-Dari by Iran Open Publishing Group. Diana Arterian is the author of the chapbook Death Centos (Ugly Duckling Presse, 2013), and her writing and translation has appeared or is forthcoming in Aufgabe, Black Warrior Review, and The Volta, among others. She is a Poetry Editor at Noemi Press, and creator and Managing Editor of Ricochet, a publisher of poetry and prose. Marina Omar was born in Afghanistan and has worked as an interpreter for Afghan refugee families. She is currently a doctoral candidate in Foreign Affairs at the University of Virginia.